The indication for CT-guided procedures vary from institution to institution, depending on the preferences of the radiologist and on the equipment available. 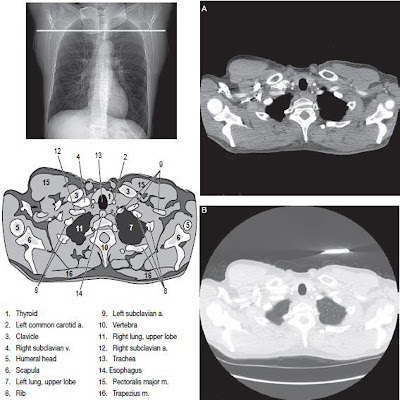 Some of the most common indications include the drainage of abscesses and pneumothoraces, punctures of abdominal and thoracic masses and lesions, percutaneous discectomy of herniated disks, lumbar spine or pelvic interventions, percutaneous administration of chemotherapeutic agents, thermoablative procedures, and percutaneous vetebroplasty. The steps to each procedure will vary somewhat. CT-guided biopsies are perhaps the most common interventional procedure; understanding the basic steps involved can provide a framework for other CT-guided procedures. In theory, the risk associated with the needle biopsy increase as needle diameter increases. When a cutting needle is used the risk may be increased. However, the overall complication rate is small, approximately 2 percent. Bleeding is the primary complication when performing biopsy most often to undetected coagulopathy. Highly vascularized lesions increase this risk. A bleeding disorder is a contraindication to percutaneous biopsy. However, patients are often treated with blood products or medications to temporarily remedy the disorder so that the biopsy can be performed. 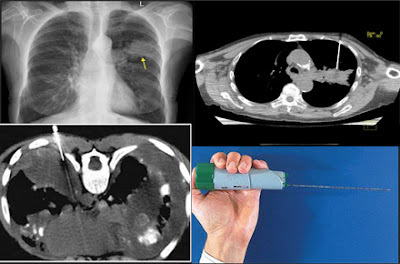 The most common complication of CT guided lung biopsy is the occurrence of a pneumothorax during or after the intervention. Using the sequential CT biopsy method can be performed on any scanner without the purchase of additional computer software, but some supplies, such as specialized needles, are required. The choice of procedure needles is usually selected before procedure based on route and indications. Automatic Core Biopsy System also known as the biopsy gun. The purpose of CT guided biopsy is to document neoplastic disease like primary, metastatic or recurrent or to differentiate neoplastic disease from other processes, such as inflammatory disease, postoperative changes, post therapeutic changes, or normal structures. Therefore, the goal in a biopsy procedure is to obtain an adequate sample for laboratory evaluation with minimal trauma to surrounding tissues. The goal is achieved with accurate and expedient placement of the needle. CT Guided biopsy is not a complicated procedure. It can be broken down into several basic steps. The procedure is explained to the patient and written consent is obtained. Appropriate laboratory values are obtained. Most laboratory evaluations include prothrombin time, partial thromboplastin time, and platelet count. The scan is plotted. This process includes careful review of the patient’s previous imaging studies to determine the optimal patient position, whether oral or intravenous contrast media is indicated, and the appropriate level for the biopsy. A scan is performed though the selected area. An important consideration in scanning for a biopsy procedure is patient breathing. Clear instructions are essential so that each breath is as similar as possible. The breathing command should be given for each scan sequence. As the needle is placed, the patient is again asked to suspend breathing. The best location for needle entry is selected. Ideally, the trajectory of the needle is planned to avoid penetration of uninvolved structures such as bowel and vascular structures. Once a location is selected a metallic marker is placed on the skin at or adjacent to the proposed skin entry site with the localizer light on the CT scanner. The scan is repeated to confirm the suitability of the selected entry location. With the distance measurement on the CT scan system, the distance from the marker on the patient’s skin to lesion is measured. This measure determined the optimal depth and angle for needle placement. The patient’s skin is prepared according to aseptic procedure guidelines. A sterile drape is applied, a local anesthetic usually a lidocaine 1%, is administered, and the biopsy needle is placed. The scan is repeated 3 to 5 mm slice thickness is typical from ct scan images, at the needle location as well as one slice above and one slice below expected needle location until the tip of the needle is visualized. If the CT images confirms the correct location of the needle, a tissue sample is taken and prepared according to laboratory protocols. A post procedure scan is taken typically at 5 mm slice thickness to identify complications such as pneumothorax or hematoma. The features that make CT an excellent choice for guiding a needle biopsy are also beneficial in performing percutaneous abscess drainage. Fluid collections that respond the most favorably to percutaneous abscess drainage are well defined, unilocular, free flowing, and accessible. Often, abscess drainage is performed under less favorable conditions, like for example fluid collection is multiloculated, composed of necrotic tissue, or poorly defined, if the patient is a poor surgical candidate. The needle placement technique duplicates that used is percutaneous biopsy. In general, the shortest, straightest access route to the collection is favored. However, care should be taken to avoid major vessels, bowel loops, and the pleural space. The fluid collection can be entered in one step with a drainage catheter or a needle. Alternatively, a needle can be place into the fluid collection, a guidewire advanced, and a catheter placed using exchange techniques. After the catheter is in place, the collection is aspirated as completely as possible. Catheter are usually left to gravity drainage. When drainage is complete, the catheter is withdrawn gradually. For fluid collections in which only aspiration of specimen is desired, this is accomplished though the targeting needle, which is subsequently withdrawn.